After high school, Michael Vick attended Virginia Tech. In his first collegiate game as a redshirt freshman against James Madison in 1999, he scored three rushing touchdowns in just over one quarter of play. His last touchdown was a spectacular flip in which he landed awkwardly on his ankle, forcing him to miss the remainder of the game in addition to the following game. During the season, Vick led a last-minute game-winning drive against West Virginia in the annual Black Diamond Trophy rivalry game. 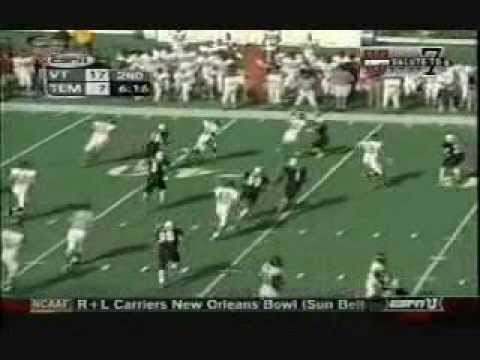 Vick led the NCAA in passing efficiency in 1999, setting a record for a freshman (180.4), which was also good enough for the third-highest all-time mark (Colt Brennan holds the record at 185.9 from his 2006 season at Hawaii). Vick was awarded an ESPY Award as the nation's top college player, and won the first-ever Archie Griffin Award as college football's most valuable player. He was invited to the 1999 Heisman Trophy presentation and finished third in the voting behind Ron Dayne and Joe Hamilton. Vick's third-place finish matched the highest finish ever by a freshman up to that point, first set by Herschel Walker in 1980 (Adrian Peterson has since broken that mark, finishing second in 2004). Lane Stadium, where Vick played his college games. Vick's 2000 season did have its share of highlights, such as his career rushing high of 210 yards against the Boston College in Chestnut Hill, Massachusetts. Against West Virginia University in the Black Diamond Trophy game, Vick accounted for 288 total yards of offense and two touchdowns in a 48–20 win. The following week, Vick led the Hokies back from a 14-0 deficit against Syracuse at the Carrier Dome—where the Hokies had not won since 1986. Vick put the game away with a 55-yard run with 1:34 left.